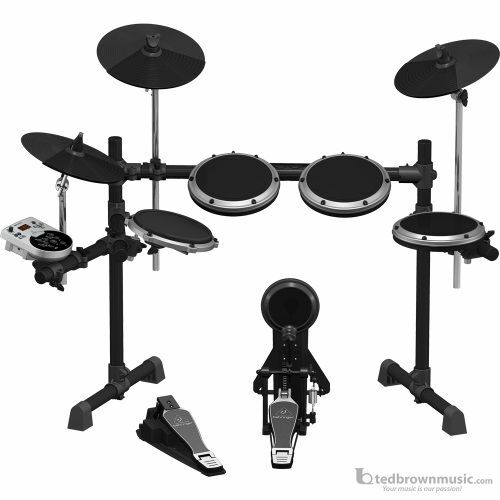 The XD8USB 8-piece electronic drum set comes with everything you need to lay down the groove including a professional-grade kick pedal with trigger pad; dual-zone snare for standard head and rim play; 3 x 8" single-zone pads; 3 x 12" cymbals; and a hi-hat control pedal. The accompanying drum rack is easy to assemble, and comes with all mounting hardware - plus the multi-pin cable makes quick work of connecting all your pads to the incredible HDS110USB sound module. With 15 drums sets and 123 sounds to choose from, every time you sit down at your XD8USB - your creativity will instantly be unleashed! Analog Input: 1 x 1/8"